HomeDo single rooms reduce HCAI? The authors included studies with a clinical outcome (acquisition of colonisation or development of infection with HCAI) when comparing clinical areas with single rooms to those with multi-occupancy bed spaces. Bundled interventions were excluded. Nine studies made the cut, and it is important to note that 8/9 studies were in the ICU setting, there was considerable variability in study design (some with control units and others a before-after design), there were different HCAI outcomes, compounded by different definitions of HCAI. Despite this variability, all but one showed a trend towards a reduction of HCAI associated with more single rooms, six of which were statistically significant. Overall, there was an approximate halving of the HCAI risk in single room environments (risk ratio = 0.55, 95% CI 0.41-0.74) (see Figure 1 below). One vitally important study, by Teltsch et al. (also finding that single rooms reduce HCAI), is missing from the analysis; I can’t understand how this study failed to meet the inclusion criteria! Again, the outcome was studies with a clinical outcome (acquisition of colonisation or development of infection with HCAI) and the variables were room size and patient proximity. Only 3 studies made the cut, all of which showed a significant reduction in various indicators of HCAI associated with increased bed spacing / room size. The review evaluated very particularly the impact on the availability of antiseptic hand rub dispensers on the rate of hand hygiene compliance. Studies including hand washing or multi-modal hand hygiene initiatives were excluded. Again, only 3 studies made the cut, all of which showed a significant improvement in hand hygiene compliance. The small number of studies that made the cut was both a strength and limitation of the review. A strength, because it illustrated rigorous inclusion and exclusion criteria. A limitation, because it meant that meta-analyses were not possible for 2/3 topics, and may have been underpowered for single rooms and HCAI. However, it would seem from the final analysis that a more towards single rooms makes a profound impact, cutting HCAI rates more or less in half. This argues for building new hospitals with a high proportion of single rooms, and looking at options to retrofit more single rooms within existing hospitals. There is a large degree of variability in the proportion of single rooms in hospitals across the world. Guidelines are divided on whether to recommend single rooms or not, with the UK recommending 50% single rooms for new builds, and the USA and Scotland recommending 100%, perhaps reflecting the low quality of the evidence-base. 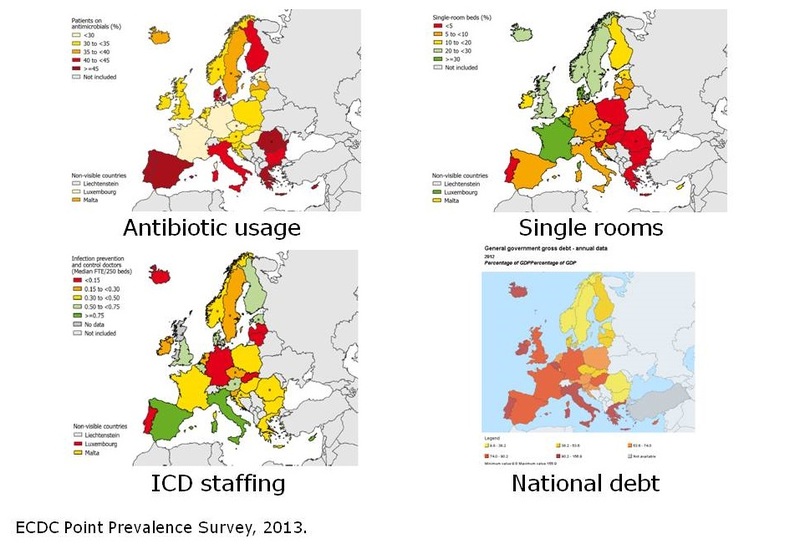 Some data available from ECDC (see figure 2 below) plots the rate of single rooms across Europe, with the heat map resembling a heat map for a MDRO (such as MRSA, or CPE). This provides further weight that single rooms are good news for preventing transmission. However, important to note there are many co-correlated variables at play here (antibiotic use, national debt, and fair play in European football championships). In the US, most hospitals have 100% single rooms. So does that mean that rates of HCAI should be 50% lower in the US compared with Europe? That is certainly not what we observe in prevalence studies. One possible explanation for this is that a high proportion of single rooms is useful in a mixed economy of single rooms and bays, providing the facilities to deliver effective isolation, but become somehow less effective when everybody has one! The reality for our practice at Imperial is a very beautiful but in many ways unsuitable hospital buildings, with a low proportion of single rooms and inadequate bed spacing. This study suggests that these factors are important drivers of HCAI. The most important outcome for me from this review is evidence to feed into plans for how new hospital buildings and renovations should look! Interesting study that got my attention as well, My personal bias: If I book a room in a hotel, I strongly prefer a single-person (or single-family) room, and I would have the same preference if I needed hospitalization, definitely in ICU. But can I justify my wishes based on the results of this review? 3. The I-square value is 81%!, implying huge statistical heterogeneity among the studies included, and some say that with such a value the pooled estimate is unpredictable and should not be performed at all (see Melsen et al, Clin Microbiol Infect. 2014 Feb;20(2):123-9). Not a word on the I-square value in this manuscript (!!!!????). That on top of all the other points raised by Jon….. Still, I will prefer a single-bed room when my time comes…. may be distance between patients is the most important risk factor, that is larger in single rooms than in double-bed rooms. However, as shortage of nurses becomes more and more an issue, the neighboring patient can call for help if I am bleeding or having other problems as patient in the hospital. Still, I will prefer a single-bed room when my time comes in the next few years with hopefully a limited disease that can be fixed.